Locust Projects is proud to present The Litany, a major site-specific installation with a durational performance intervention during Art Basel Miami Beach 2018 by the Chicago-based artist Bethany Collins. The exhibition will open with a public reception on Friday, November 16, 2018 from 6:30 pm to 8:30 pm. 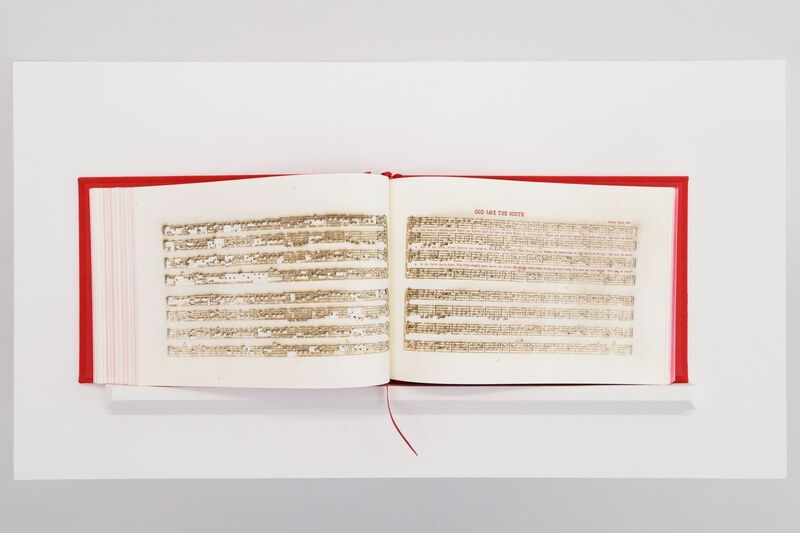 In the center of “My destiny is in your hands”, is a copy of “America: A Hymnal”, an artist book by Collins from 2017. The hardcover-bound book consists of 100 versions of the song “My Country ‘Tis of Thee”. Since the original version’s debut by the Rev. Samuel F. Smith on July 4, 1831, the lyrics of “My Country ’Tis of Thee” have been re-titled and re-written at least one hundred times between the 18th and 20th centuries. Each re-writing—usually done in support of a passionately held cause, from temperance and suffrage to abolition and even the Confederacy—articulates some version of what it means to be American. Like the meanings of state flowers, these patriotic hymns are sometimes love letters, sometimes indictments, or both.